The owner of the popular Crown Heights kosher restaurant Basil is planning to open a bakery on Albany Avenue, pictured here, this summer. 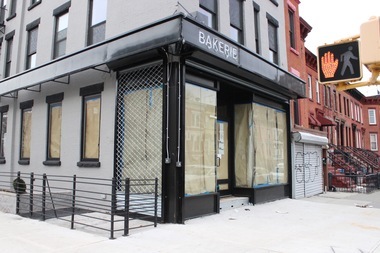 CROWN HEIGHTS — A new kosher bakery is coming to the neighborhood this summer, bringing “finer baked goods” to a renovated Albany Avenue storefront, its owner said. “We want to create an experience,” he said of the new eatery located on the corner of Albany Avenue and Sterling Place, set to open in June or July. Bakerie is set to be more like a marketplace than a coffee or sandwich shop, he said, with a selection of large bread loaves for about $7 or $8 dollars each, assorted pastries and baguettes, a handful of prepared sandwiches (made with the bakery’s bread at Basil, three blocks away) and flavored butters and jams. When asked to describe the shop, Branover was quick to say what it’s not. “We’re talking about integrity. No preservatives … finer baked goods. No specific style — a little bit French, a little bit Italian — but very modern breads,” he said. Branover, a native of Israel who works full time in energy management and had never run a restaurant before opening Basil in 2010, said he has two goals in mind for the new bakery: elevating what people expect from kosher food and bringing together what he calls “a big divide” between those who eat kosher and those who don’t. At the same time he’s preparing to open Bakerie, Branover is also renovating a second space on Kingston Avenue to become “Meat,” a restaurant serving exactly what the name suggests, all kosher prepared. He said that location will open sometime this summer. Bakerie is located at 252 Albany Ave. in Crown Heights.